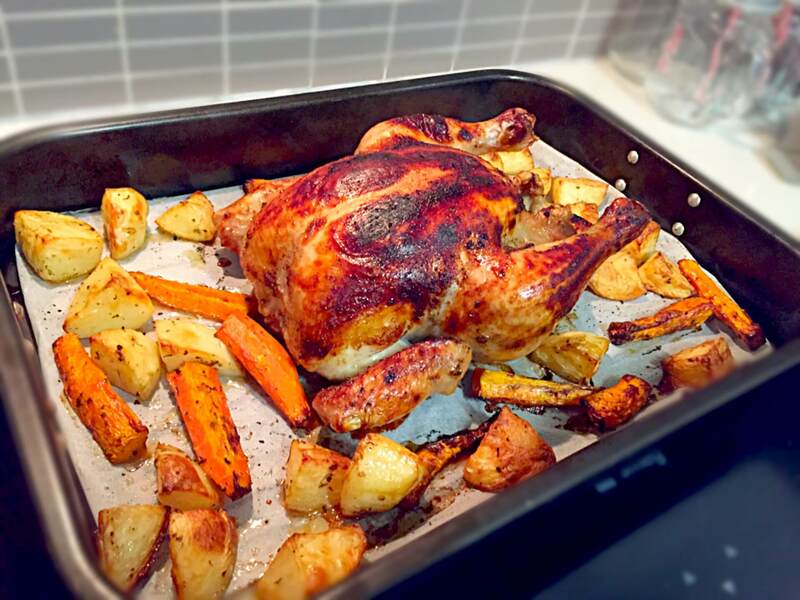 Roast chicken is one of those wonderful meals that looks fancy, tastes delicious but is actually relatively cheap and easy to make. Anyone can cook the perfect roast chicken and vegetables with just a little guidance. Place chicken in middle of baking dish and brush with oil. You can add some seasoning if desired. Place vegetables, 2 tbs olive oil, mixed herbs and garlic in a small plastic bag and shake to coat. Put veggies into pan around chicken. Cover chicken with aluminium foil. Place baking pan into oven. Bake for 1hr covered then uncover and bake for a further 30minutes. Check cooked through by inserting a skewer and making sure the juices run clear. Serve with green beans & gravy. Just saw this. Roast chicken is my cooking nightmare, it’s so easy, but I can never get it perfect. In the picture there baking paper on the tray. Do you bake the chicken and veg on the baking paper?? Or use a rack? ?